This review has been haunting me for weeks. After seeing The Road, the feel-good movie of the year, I was depressed for the better part of a week. There were not words for the emotions it conjures; the world dead and a man who’s only warrant is to keep his ten year old son alive for no other reason than to live on. The haunting performances and the world in which these characters had me in an introspective funk for days, pondering, the real meaninglessness of the movement of our daily lives when faced with true and final adversity. It is rare that a movie will take a man down a notch; make him stop and reevaluate everything that is important in lieu of loosing everything. The story follows “The Man,” played by Viggo Mortensen, as he is named in the Cormac McCarthy book by the same name. The world has died, for whatever reason, and he and The Boy are surviving together ten years on. The world is dead, The Man explaining in a voiceover: “There was a bright light, followed by a series of loud booms.” The movie, and the book I’m told, takes no time to explain why the world is dying; it simply is, and these two are the only thing each other have. They take to the road, The Man’s wife suggesting that if they move south, they can get somewhere where it is much warmer. The movie, from my understanding, is far bleaker than the book. Nothing has survived. Cannibalism is running rampant. There is no food; our protagonists are eternally hungry. They scavenge and they move and they hide from the prowling marauders of cannibals that move across the countryside. Really though, these plot devices are really only used to show the relationship between The Man and The Boy. The Man is eternally suspicious of everyone, anticipating the worst for him and his son at every human interaction. The Boy, born into this world, has a far less sinister observation of the world, and yearns for human contact outside his father. The dynamic puts the two at odds. As the two move across the landscape, the father attempts to instill into his son the lessons of a world long since dead. This is counter to the reality of the world they live in now. In one particular scene, The Man tries to explain to The Boy what a Christmas tree is. The Boy, born into a world that knows no Christmas, looks at him blankly. What would be to us a charming nostalgic moment demonstrates the disconnects between realities; The Man trying to hang onto parts of his world, and The Boy trying to process the reality that history, as we know it, is dead. Another moment finds them on the beach, looking out at the water. The Boy asks “What’s on the otherside?” The Man simply answers: “Nothing.” There is no need for a lesson here; it has no use to their current survival. This movie makes you think. This movie challenges you. The current fad of Armageddon end-of-the-world movies is supplemented by Mortensen’s intensely personal and emotionally wrecking performance. There is a whole sequence of flashbacks regarding Charlize Theron that will emotionally crush you. I didn’t have a moment of disbelief when watching a new star in the making, Kodi Smith-Mcfee. There is a story that the boy got the part by recreating the scene where The Man shows The Boy how to commit suicide by putting a .45 in his mouth. Yeah. It’s that kind of smiles and sunshines that keep this movie going. There is a hook at the end of this movie that has led me personally to much speculation. There is discussion by The Man discussing what happens when they dream. Pay particular attention to this at the end. I have theories, but I will not spoil here. All in all, the end is worth the means. Take a few hours and travel “The Road.” You may find yourself reconsidering what is important to you, and anything that can do that is worth a watch. A. Moving. Disturbing. 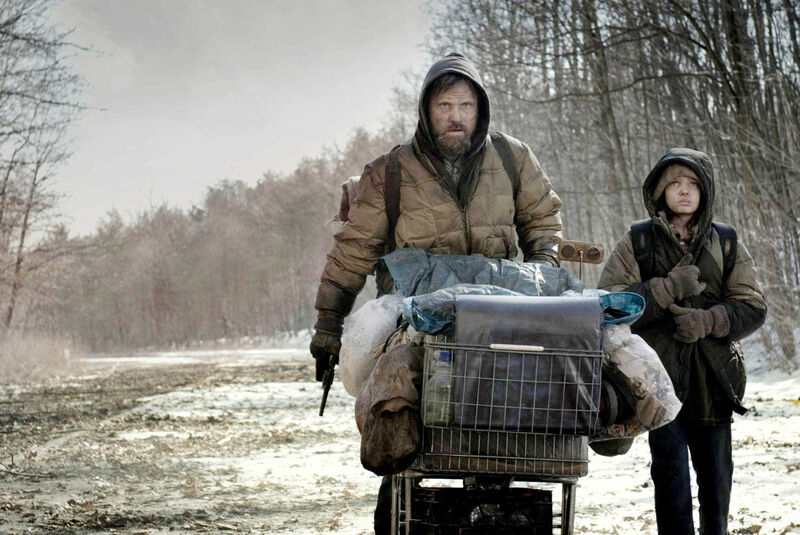 Lost in the world that Director John Hillcoat brings to life, you’re with these two as you can’t help but hope for them through the gray.